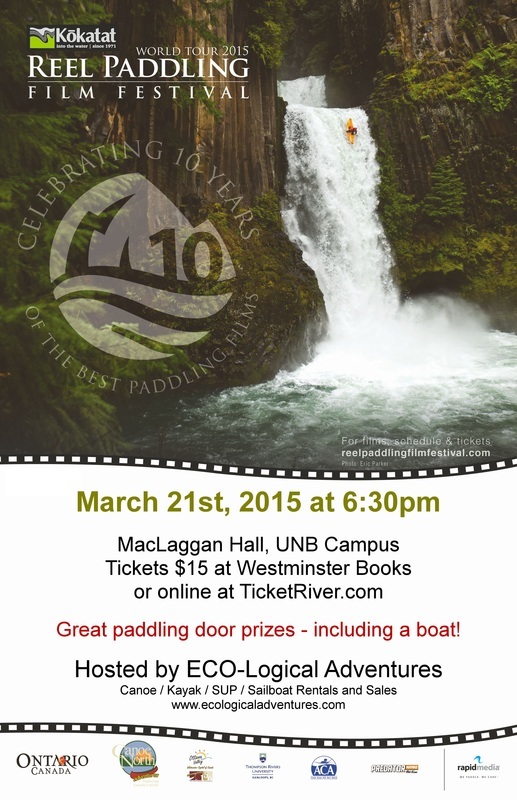 Fellow paddlers, come on out to this great social gathering to kick off the paddling season. 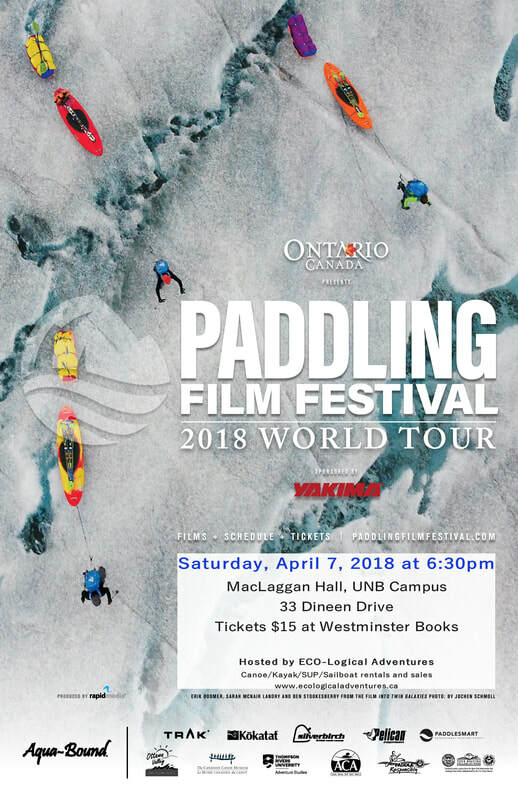 The event will be showcasing the top paddling films of the year from around the world. Paddling related door prizes to be won. See you there!! The Canadian Voyager Brigades will be hosting an event in celebration of Canada's 150th anniversary on the historic St. John River this summer and registration is now open for whole crew or individual paddlers to join in on this 7 day trip. On this page you will find links and informational pages supporting more than a dozen big canoe events planned for next year that span our country from west to east, and north to south. These journeys and brigades will be a celebration of Canada, of our history of cultural cooperation, for water stewardship across our country and for developing our next generation of paddlers. Contact Person: Brendan Chase - 506-260-9090. This is the rescheduled trip from July 18th. We will begin at the same put in location (11 McGloin), and take out at the small craft aquatic centre (behind the Victoria Health Centre, 65 Brunswick Street). People are encouraged to meet at the take-out for 5:30 to coordinate shuttling. Bring your vessel of choice, or club members may borrow a canoe or kayak if needed. Please provide a days notice if you would like to borrow one of the club boats. And as always, new members welcome! Membership forms will be available. ​Come on out to Eco-Logical Adventures in Oromocto this Thursay to grab a burger, meet up with other club members, and go for a evening paddle around the lower Oromocto River. We'll be discussing any possible upcoming trips as well so come with your ideas! Canoes, kayaks, and SUP's will be available for people to use however you may also bring your own if you wish. New members always welcome from newbies to seasoned veterans! We'll have membership forms available for those who would like to join. Eric McCumber will present his 3 week paddling trip down the St. John River. This trip follows an the old communications route used by First Nations and subsequently by French and English settlers. Travelling a distance of 460km from Fort Ignall, Qc to Saint John, Eric and his wife stop in several communities along the way. Join us to learn more about the logistics of this river trip as well as the historical significance. Our AGM will be held on Thursday, March 17, 2016 at 6:30pm. We will gather in the meeting room of Sobeys on Regent Street. New executive members will be sought for positions of President, Vice President, Secretary, and Treasurer. You are encouraged to attend and bring your ideas for the coming season. Please think of how you can help this club succeed, whether it be through joining the executive, planning events, volunteering at events, leading group outings, teaching courses, advertising, or other. 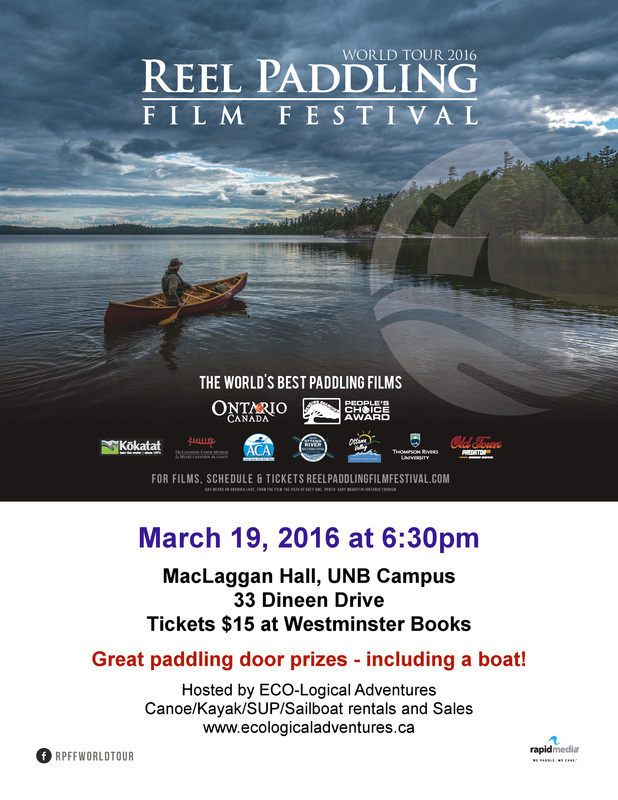 The Reel paddling Film Festival is coming back to Fredericton on March 19, 2016. 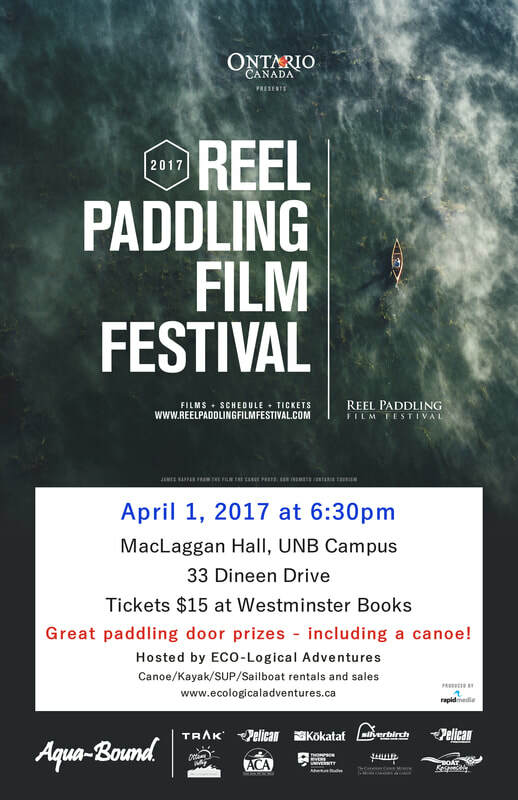 The Reel Paddling Film Festival showcases the top paddling films of the year from around the world. The films include white water, sea kayaking, stand up paddleboarding, and canoeing. The films are rich in scenery, culture, music, and nature. With a diverse selection of films there is sure to be something for everyone. This event provides a great opportunity to meet up and chat with fellow paddlers as we head into the beginning of paddling season. Anyone wishing to paddle as a group can meet Ken MacDonald at Second Nature Outdoors at 6pm. Ken plans to lead the group up river towards the islands or possibly across the river to the Nashwaaksis Stream. **Please note that next week we will be at Second Nature Outdoors again so we can fit in one more paddle night with them before they close their doors for the season. Next weekend we are planning a group trip on the St. Croix River. We are paying for a shuttle to save time. If you are interested in joining on this trip please let us know so we can make the proper arrangements. Where: Upper Saint Croix, McAdam to Loon Bay. Aug 18 - Mike will be at SNO tonight at 5:45pm to meet with any paddlers wishing to paddle as a group. Given the heat it would be a great time to play in the water, practicing wet exits and rescues would be refreshing! We will meet at the Small Craft Aquatic Center at 5:45pm and drive out from there. If you need a boat or a drive please contact us and we will try to set up accommodations. Check out the 2015 gallery on the Tumblehome website; some pics have been posted from this years' outings. More pics will be posted soon. There will be a group paddle at Kelly Creek on Thursday evening, July 30th. For those who are interested in participating in this outing we will meet at the Small Craft Aquatic Center at 5:45pm and head out from there. Bring your boat and safety gear. Please contact us if you would like to participate but do not have a boat, we will see what we can do. For our next group paddle night with Second Nature Outdoors on July 7 (rain date July 9) we are planning an outing with the voyageur canoes. We will meet at the Small Craft Aquatic Center at 6pm, from here we will be taken by shuttle bus to the Bucket Club. At the Bucket Club we will be loaded into big canoes and taken on a guided trip through the islands finishing up at the Aquatic Center. We will learn some basic skills on how to paddle together and steer the large boat while also enjoying the sights and social time with fellow members. Once on the water the trip should take approx 2hrs. We require a minimum of 6 people with a maximum of 13 per boat. Please let me know if you would like to be signed up for this event. If you are not interested in attending this special event you are still welcome to make use of regular SNO boats from 4-8pm on July 7 (July 9). Our group paddle will take place on Thursday evening this week. We will meet at Angelview Park on the Woodstock Rd at 6pm. We will paddle up and around the islands and return to our put in location. You will need to have your own boat and gear. We may be able to bring along an extra boat or two for those who need one. Please contact me if you are planning to attend, if you would need a boat, and/or if you need directions. Angelview Park is located on the Woodstock Rd just beyond Mike's auto repair. We will meet Tuesday, June 9 at the Small Craft Aquatic Center @ 6pm. If the weather is questionable check with Second Nature Outdoors to see if they will be open for our event. Our rain date will be Thursday June 11. The meet and greet BBQ originally scheduled for June 2 has been rescheduled due to poor weather. We will hold the BBQ on Thursday, June 4th instead. The weather on Thursday is supposed to be warm and sunny. Bring your appetite, a change of clothes and some bug spray! We can make use of canoes, kayaks and stand up paddle boards. Eat, socialize and paddle! Please let us know if you plan on attending so we can be sure to have enough food for everyone. Hello paddlers, in lieu of the Nashwaak River trip that was originally scheduled for this weekend, we will be teaming up with the Fundy Paddlers for a joint trip on the Musquash. This will be an easier paddle accommodating any novice paddlers. Evan will point out some camping and hiking options along this route. I will be driving my car and will have extra room, if anyone wants to car pool let me know. I also have an extra kayak I can bring if anyone needs a boat. I hope you will join us on Sunday, the forecast is looking good! The club will be hosting a meet & greet BBQ on June2 @ 6pm at Eco-Logical Adventures in Oromocto. We will gather to eat and socialize and head out on the water for a short paddle to kick off the paddling season. Our club boats are stored at the Small Craft Aquatic Center with Second Nature Outdoors. Tumblehome members who have paid and signed waivers for 2015 will have free access to Tumblehome club boats at any time through the week when SNO is open. We currently own 2 Canoes and 2 Kayaks as well as paddles, PFDs and safety gear to go with them. This year we will alternate locations for our weekly club paddle nights. One week we will meet at the Small Craft Aquatic Center where we will have access to the SNO fleet, the following week we will choose a location in or around Fredericton in which to launch. We will switch back and forth each week in order to better accommodate the skill and interest levels of our members. At SNO we will be better able to accommodate newer paddlers and members without their own boats. At this location we will have access to stand up paddleboards, canoes, kayaks and possibly even voyager canoes this year. On alternate weeks we will launch from different areas around Fredericton in order to keep things interesting for the more experienced paddlers. Where possible we will make efforts to accommodate members without boats for these outings. Our group paddle nights will be scheduled for Tuesday evenings through the summer with the rain date being Thursday of the same week. At SNO we will have access to boats from 4-8pm on Tuesdays (or rain date Thursday). Members are welcome to access boats and paddle on their own and/or meet up with the group at 6pm. Please be sure to check the SNO Facebook page or call them @ 460-2260 to make sure they are open before heading down. SNO will be closed if staff determine the weather is not suitable for safe paddling (eg. high winds, thunderstorms etc). Second Nature Outdoors is located downtown at the Small Craft Aquatic Center at 63 Brunswick St. Dates for weekly group paddle at SNO (with rain dates) - June 9 (11), June 23 (25), July 7 (9), July 21 (23), August 4 (6), August 18 (20), September 1 (3), September 8 (10). Dates for weekly group paddle at alternate launch locations - June 16 (18), June 30 (July 2), July 14 (16), July 28 (30), August 11 (13), August 25 (27), September 15 (17), September 22 (24). This coming weekend, May 14-17 is Paddlefest weekend in Saint Andrews. 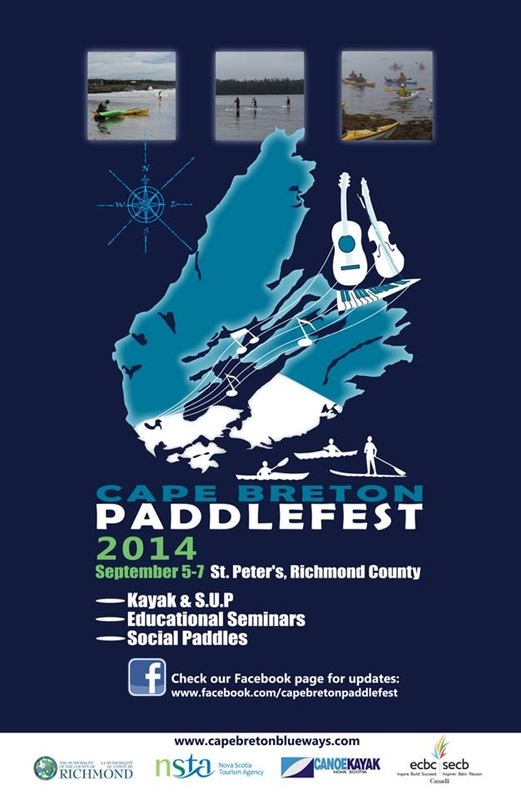 Rob Lemmon and Alex Reid of Maritime Daytripping will be providing some free paddling events to the community. Everyone with proper paddling gear is encouraged to attend and take advantage of this great opportunity. Check out the document below and scroll down to see the full schedule of events. We held our AGM in April and have been busy making plans for this coming paddle season. Details about weekly club paddle nights and the 2015 trip schedule will be ready soon. The first trip of the season is a joint trip with the Fundy Paddlers Club this coming weekend. The trip will be in Welsford on the Nerepis River. Those who wish to attend must be a member of one of the clubs and must have a dry suit or a wet suit to wear as well as an appropriate boat and safety gear. Please let Nancy know if you plan to attend. We will have a trip on the Nashwaak River in May, the date will be posted soon. Our Annual General Meeting has been scheduled for Thursday, April 9 @ 6:30pm. 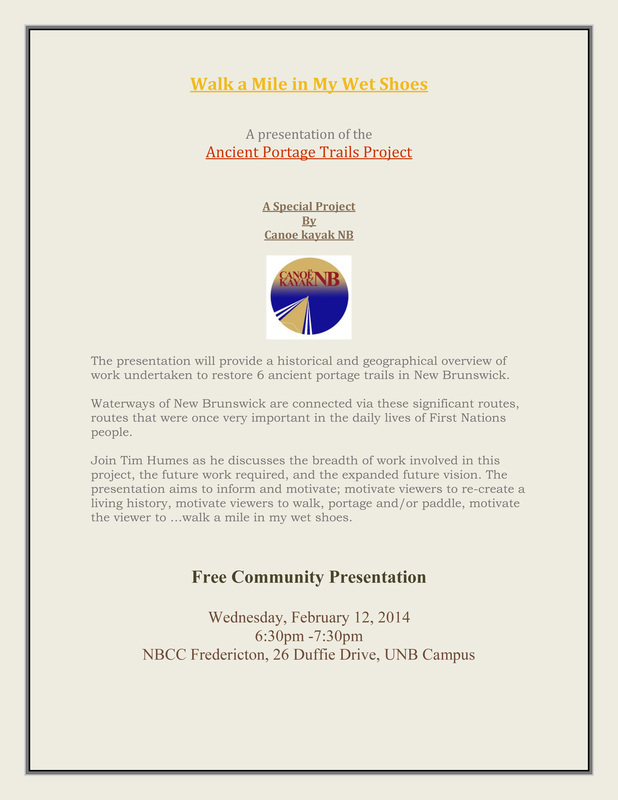 The meeting will be held at the Fredericton Library in the large meeting room. Members are encouraged to attend. Bring your ideas, questions and comments. We are always looking for help with organizing and running activities, if you have some interest and a little time to commit please let us know. I will be leading a family friendly group paddle this weekend from Morell Park in Fredericton to Eco-Logical Adventures in Oromocto. We will meet up at the boat launch area of Morell Park. Depending on weather/river conditions and the abilities of our group, the trip should take a few hours. If the weather is nice we will stop and play on Oromocto Island before we head to the take out location. If you are interested in coming along for the trip please let me know, and if you need a boat let me know that as well. Peter Brown and Rob Neish are offering a Paddle Canada Introduction to Moving Water Canoe Tandem course. They will teach basic skills that will enable you to paddle rivers with confidence and comfort. This introductory course will cover essential knowledge such as reading a river and safe paddling practices. It will also cover skills such as front and back ferries, and eddy turns and peel outs. If you like to paddle a canoe and enjoy being on New Brunswick's rivers then these skills will help you to enjoy them to the fullest while feeling confident and safe! For our paid members who are interested in taking this Paddle Canada certified course, we are willing to offer a subsidy. The club encourages skill development and would like to help members afford high quality courses. Let me know if you would like to fill a seat in this course. Paddle Canada Certified course with Evan Young of Gibson Creek Canoeing. More info to follow. With demonstration and hands on practice, this clinic will teach you skills for solo canoeing with refined movements for style to make your canoe dance. This course is free to attend and will be held at kilarney Lake on the evenings of Sept 9 and 12. Instructors from the Fundy Paddlers Club are feeling generous and want to pass on the skills that they have learned. Come out and take advantage of this FREE opportunity to gain and/or improve your solo skills! If you are in need of a boat in order to participate, please let me know. This Week is the last week that the Small Craft Aquatic Center will be open for the season. This means that Wednesday ﻿Aug 25﻿ is the last weekly group paddle from this location. We have access to all Second Nature Outdoors boats on our paddle night. In case you weren't already aware, they have Stand Up Paddleboards in their fleet. For anyone who has been wanting to try out a Stand Up Paddleboard, come on out Wednesday (weather permitting) and give one a try! There is a group trip planned for Aug 30 on the St Croix River, more details to follow. Members who have paid their dues and signed waiver forms can access our club boats (2 canoes and 2 kayaks) for free on any day that Second Nature Outdoors is open. On Wednesday nights we are now able to use SNO boats from 2-8pm. There are plenty of benefits of joining the club but the most obvious one is that the membership is $15 and it gives you free access to boats, compare that to renting a boat at $12/hr. Weekly group paddle nights are weather dependent. We access our boats through Second Nature Outdoors, if they are closed due to bad weather then our paddling night will be cancelled. If you are not sure if they will be open please call them at 460-2260 before heading down. We will be starting our weekly Wednesday group paddle nights out of the Small Craft Aquatic Center location on June 11! Club members wishing to take part in activities will need to submit their completed waiver and membership forms along with their membership fee for 2014. To kick off the season we will be hosting a Meet & Greet BBQ at 6pm. Members can access boats from 4-8pm. Mike and Rhonda will be on hand to take new membership forms/dues starting at 5:30pm. I would like to extend appreciation from the Tumblehome Paddlers Club to John for his initiative and to the businesses for their contributions to our community. Thank you! Our first group trip of the year is happening on May 31. Paddlers will be led on a trip down the Nashwaak River. See attached document for more details. Starting in June we will be hosting our weekly group paddle nights out of the Small Craft Aquatic Center. On Wednesday evenings from 4-8pm members will have free access to club boats as well as the SCAC rental fleet. We will set a group meet up time for those who are interested in paddling together. ﻿The Tumblehome AGM will be held on Wednesday, April 30 in the community room of the Sobeys store on Regent Street. Come find out what the club has in store for the 2014 season. Have your say in the club activities and find out how you can become more involved. Beth Johnson and Paul Meyer will be giving a presentation on their Nahanni River trip. Join us on April 9th at 6:30pm at the Ducks Unlimited building on Union Street. The Annual General Meeting for our club will be held on March 26, 2014 in the community room at the Sobeys on Regent Street. The meeting will start at 6:30pm, all are welcome to attend. Come along and find out what the club has in store for the 2014 season. Cancelled due to bad weather, will be rescheduled for April! 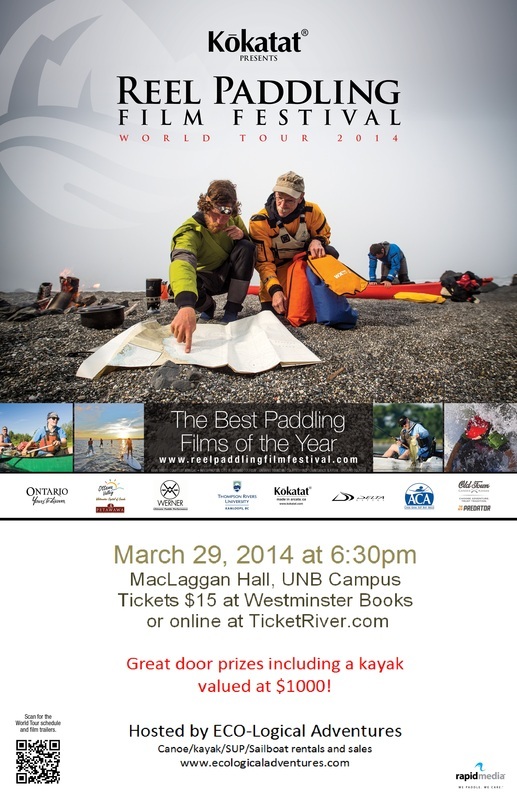 Eco-Logical Adventures will be hosting the Reel Paddling Film Festival in Fredericton on March 29, 2014. At the film festival we will be showing the top paddling films of the year from around the world. The films include white water, sea kayaking, stand up paddling and canoeing. These films are rich in scenery, culture, music and nature. With a diverse selection of films there is sure to be something for everyone. To view clips from previous years check out www.reelpaddlingfilmfestival.com. Paddling related resources will be on display and lots of great door prizes will be given away including a kayak valued at $1000!! This is a great opportunity to meet up and chat with fellow paddlers during the off season. I hope to see lots of you there! The Canadian Parks and Wilderness Society are hosting a FREE screening of the film Planet Ocean, an internationally acclaimed documentary directed by Yann Arthus-Bertrand and Michael Pitiot. This film has wonderful cinematography and eye-opening images. This event takes place at Tilley Hall on UNB Campus on Nov 6 @7pm. All are encouraged to attend. The Fredericton Power and Sail Squadron are hosting a presentation of a 28 day trip on the Nahani River. The event will be held at the Charlotte Street Arts Centre in the multi-purpose room on Nov 6 @ 7:30pm. Fredericton’s boaters, paddlers, and adventurers will want to hear this picture rich Nahani River presentation by Fredericton’s Favorite Paddlers Beth Johnston and Paul Meyer. These speakers will tell you about provisioning, logistics, and adventure from 28 days on the Nahani River. The Nahani in our Northwest Territories is said to be the most visually diverse river in the world and was the first UNESCO World Heritage Site. A riverside cleanup is being organized along the St. John River near the walking bridge. Large tires and other refuse has been in this area for a long time. We are looking at getting help from the city to help move these large items. An email message will be sent out when a clean up date is set. There will be a fall paddling trip on Monday, October 14. We will put in at Woolastook Park and paddle at Longs Creek and possibly go up river from there. We will get on the water early in the morning so we can see the little wisps of fog still hovering above the water and catch the early morning sun hitting the trees. We will paddle leisurely for up to 4hrs (~8am-12pm). It will be very cool in the morning and if the weather forecast holds true it should warm up. You will need to dress warmly wearing layers and bring extra clothes in a dry bag. Depending on how many people are coming we may be able to accommodate a couple of people who don't have their own boats. Please email me if you would like to come along. - I am currently in talks with a couple of people who have agreed to give presentations on interesting trips they have been on. - I have been granted permission by Zac Crouse to host a showing of the film 'Paddle to the Ocean' to our group. I will let you know when we have dates set. If you have ideas for fall/winter events or presentations you would like to see happen please let me know and I will do what I can do to help organize. We have had wonderful turn out for our weekly club paddle nights this summer. Unfortunately the Small Craft Aquatic Center will be closing for the season at the end of August. Our last weekly club paddle night at the SCAC will be held on August 28th. We can continue to have weekly paddle nights into September if there is interest from members. We can choose to meet up at different locations. Arrangements will need to be made for members who do not have their own boats. We have 2 club canoes and 2 kayaks that can be made available. We will be having a basic training session at Kilarney Lake on Saturday, August 24th starting at 2pm. We will review some basic strokes, steering, and rescues. This is intended to help newer paddlers get up to speed, as well as provide a review for other paddlers. If you are interested in joining in on this please send an email through the contact section of this website. Meet & Greet BBQ at the Small Craft Aquatic Center on Wednesday, July 24. There will be free boat usage from 4-8pm for current TPC members and newcomers to the club. Food will be ready around 6pm. We encourage everyone to come out for an evening of food, socializing and paddling. If you plan to attend the BBQ please msg me so I can make appropriate food arrangements. If you plan to make use of the free paddling please call the SCAC to reserve a boat. Weekly club paddle nights will take place on Wednesday evenings between 4pm and 8pm at the Small Craft Aquatic Center, starting June 26 until August 28. Members have access to club boats and SCAC fleet for FREE!! All you have to do is call ahead to reserve your boat (SCAC 460-2260). Club boats will now be stored at the SCAC year round. Members will have access to these boats by reserving them on a first come first serve basis. Our 2 canoes and 2 kayaks are now fully outfitted, thanks to the support of local companies ECO-Logical Adventures and Maritime DayTrippers, who supplied universal fit PFDs and safety kits, respectively.